Lambeau Field Stadium Tours is located on the east side of Lambeau Field and is accessible from eastbound Lombardi Avenue / County Highway VK, east of its intersection with South Ridge Road, at or near 1265 Lombardi Avenue, Green Bay, Wisconsin 54304. 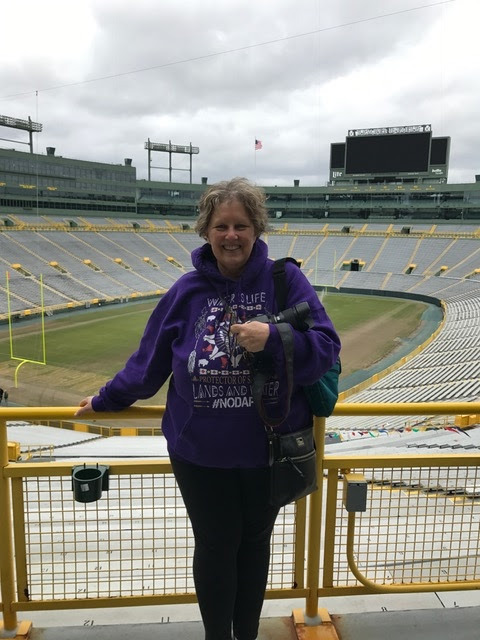 I'm a 3rd generation California girl, born in Martinez (also birthplace of Packers Tight End Richard Rodgers -- whom I have met and who is just a doll) and raised in Southern California. I knew nothing about Green Bay or the Packers when I moved to Wisconsin in 2011 for a job. Last year was the first time I got the "fever" -- well, several of the star players are from California! Quarterback Aaron Rogers, Linebacker Clay Matthews, and the aforementioned Tight End Richard Rodgers. So, rooting for the Packers is pretty much like cheering on California (just the way I look at it). 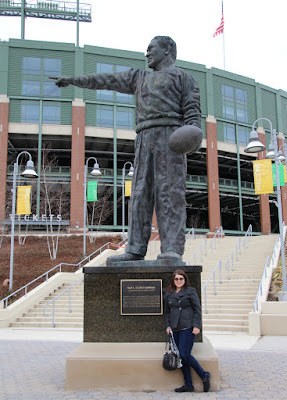 I've learned the history of the Packers over the years and it's quite fascinating and moving! There's the Packers Heritage Trail (I've photographed all those markers) and the Oneida Nation Walk of Legends (I've got all but one). Plus, the Packers have a way of consistently providing nail-biting-exciting games (thus the nickname, "Heart Attack Pack")! 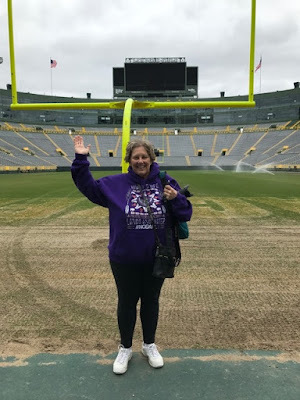 So, when my friend Joy came to visit from Westchester County, New York, this week, of course we had to tour Lambeau Field. It was a blast! The stadium is a living shrine to the Packers, replete with historical plaques and photographs and bursting with the contagious energy of the gazillion fans who have attended Packer games over six decades. 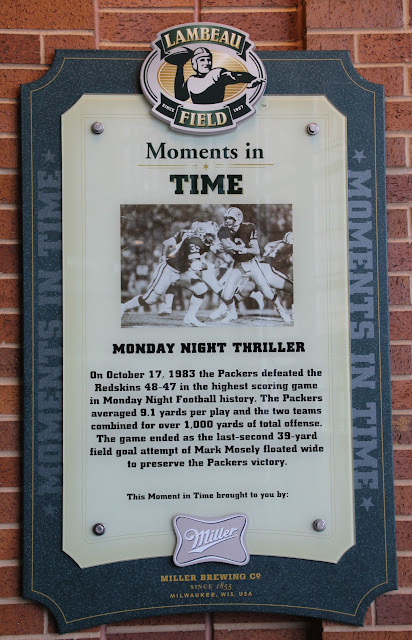 The highlight of the tour -- descending to the field level, walking past the Packers' locker rooms, heading through the Packers' tunnel while a recording of cheering fans fills your ears, and, finally, stepping out on "Hallowed Ground" at the Packers end zone. Yah, it was really cool and downright spiritual! Bring your camera! 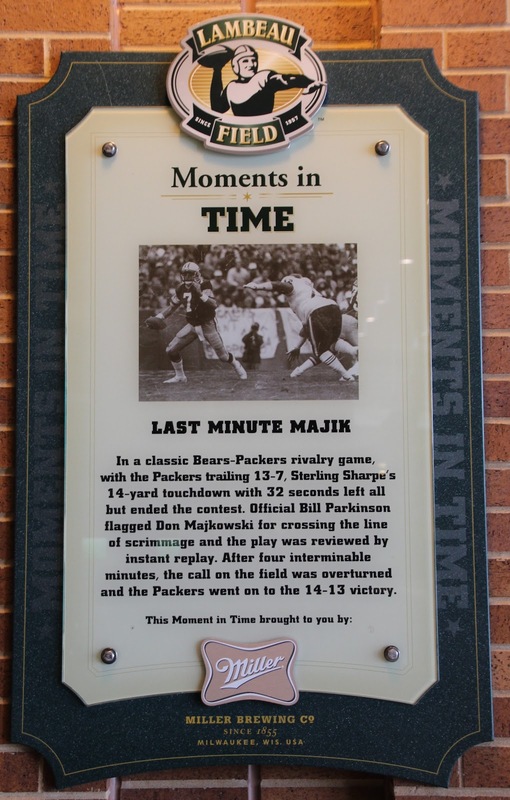 The Packers are exceedingly generous. There are no restrictions on photography. Wear good walking shoes and/or bring a portable seat; the tour lasts an hour and 15 minutes and is about a mile long. You'll mostly be standing, although there are a couple of stops when you get to sit for 10 minutes or so. Use the bathroom before the tour starts; there's only one bathroom break, and it's about 45 minutes into the tour. You'll be subjected to the weather outside more than being inside; dress appropriately (and be prepared for considerable wind chill in colder months). 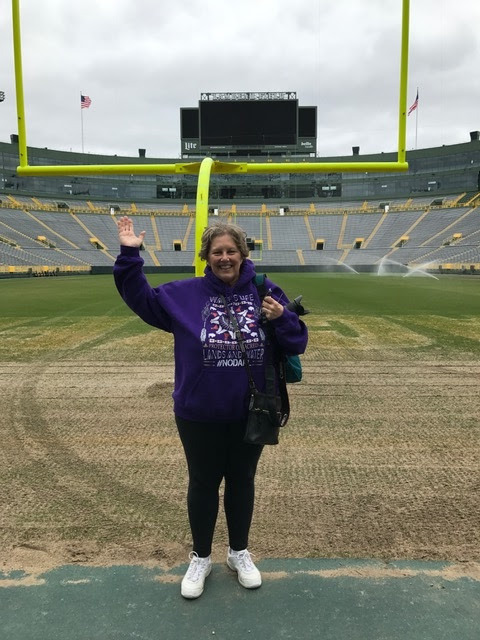 Finally, regardless of which NFL team you root for, don't miss the opportunity to tour Lambeau Field -- it really is magical! My friend Joy, visiting from Ardsley (Westchester County), New York. The tour begins in the atrium. 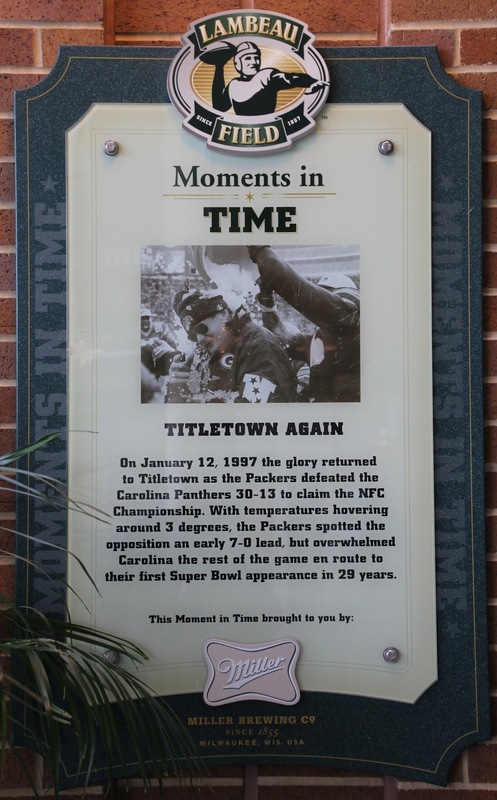 relate Lambeau Field "Moments in TIME"
view of the Brown County Veterans memorial. with Vice President Richard Nixon and NFL Commissioner Bert Bell in attendance. 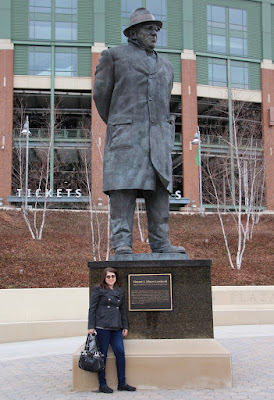 Packers’ founder and first coach Earl “Curly” Lambeau. At the Club Seats level . . . 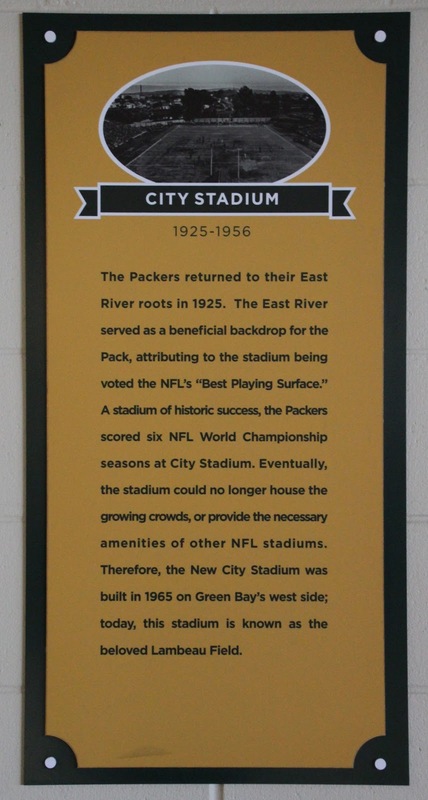 The view from the Club Seats level . . . 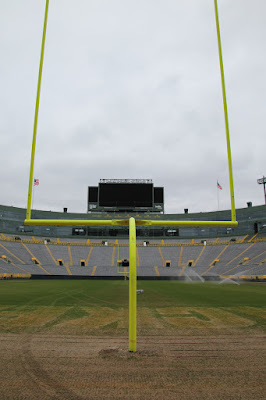 The largest G in the world -- at the top of Lambeau Field. View of the G from Allouez Cemetery, about 3 miles away. Views from the Champions Club seats . . . Looking northeast, at the Leo Frigo bridge. Looking southeast across the Frozen Tundra . . . The plaques below are placed throughout the Champions Club. I was able to photograph only about a third of them. Looking down the tunnel from the entrance to the locker room. Almost to the field . . . This place is BIG -- and it was freezing-___ cold!!! 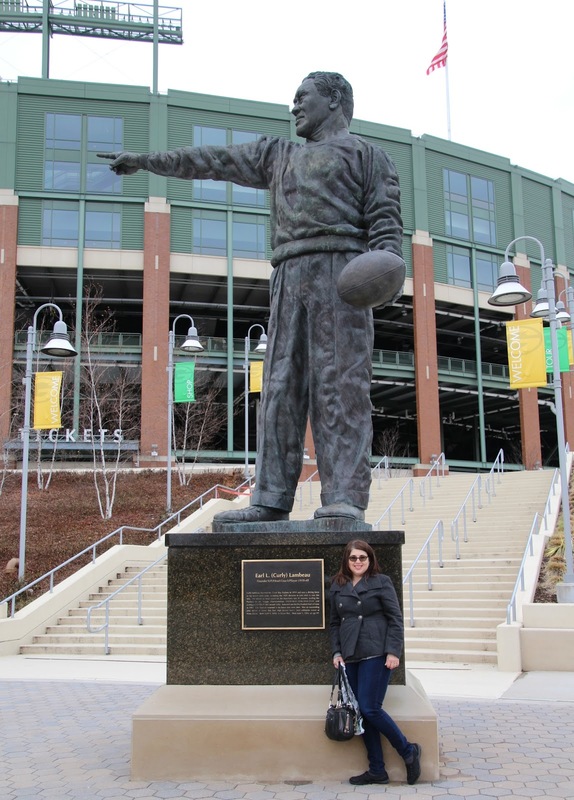 At the goal -- GO PACK GO!!! Looking up at the score board from the field. 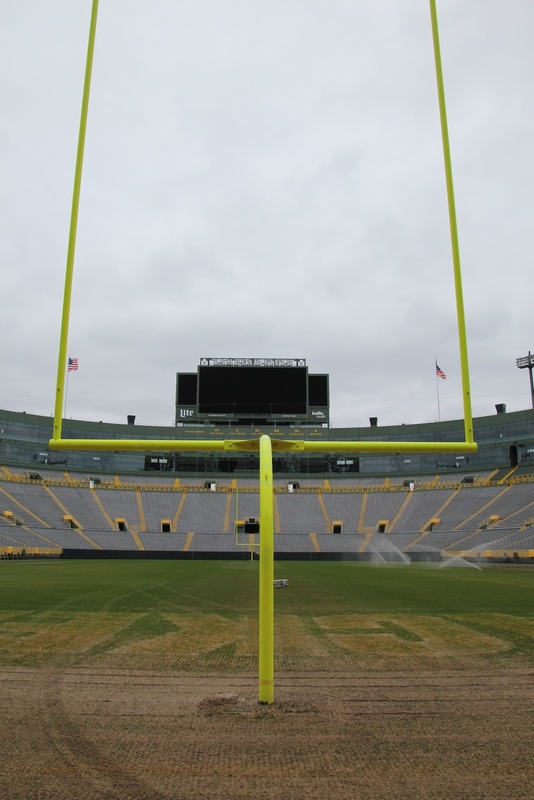 At the Packers end zone. 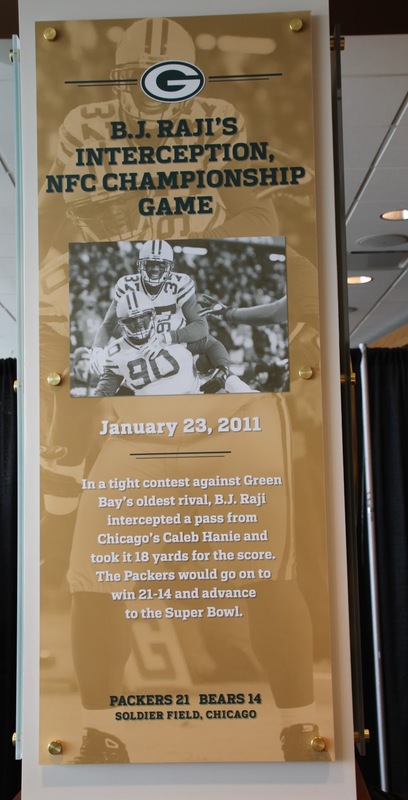 Having fun at the "Lambeau Leap" photo op. 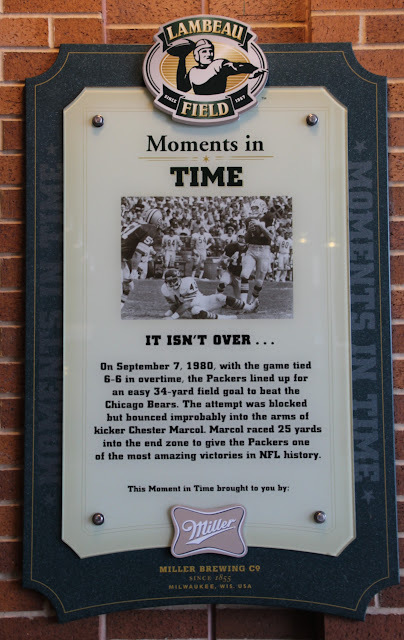 "Love at First Leap" is at the entrance to the Packers Pro Shop. 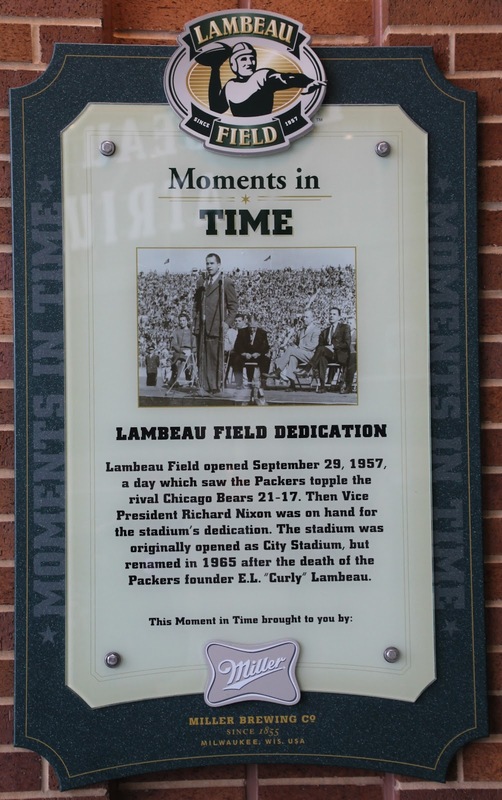 Lambeau Field is located in Green Bay, Wisconsin. 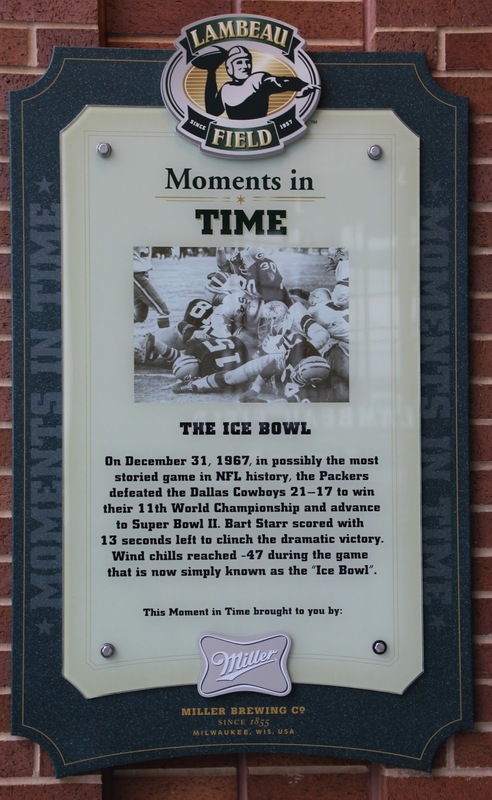 Awesome pictures and account of Packers history! It was a fun day!